The New Year may be upon us, but that doesn't mean your go-to denim is going anywhere. If you, like dozens of fashion girls, plan on wearing your skinny jeans well through 2020, you've come to the right place. Chances are you're feeling zapped of outfit inspiration for the jeans or have found yourself in a rut of wearing the same combos over and over. Fret not. We're here to fill up your tank of ideas, so to speak, with a fresh batch of trends that will have you dreaming up how to wear skinny jeans in 2019. Five of the season's biggest trends just so happen to play extremely well with the denim. Enter the coziest trend of the year, fuzzy teddy coats, which just so happen to be the bulky outerwear your skinny jeans were made for. Then there's the wave of tough combat boots the fashion crowd is all loving right now. Tuck your skinnies into the leather lace-up boots and never deal with that awkward ankle bunching again. Keep reading to discover and shop the five new 2019 trends that are perfect to wear with skinny jeans. The coziest trend of winter 2019? 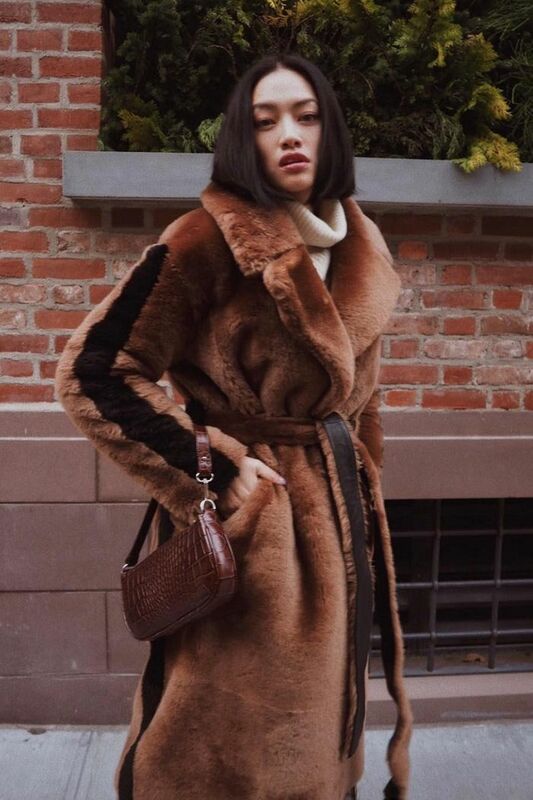 Without a doubt, all the faux-shearling and teddy coats floating around our Instagram feeds and favorite retailers. It was love at first sight with this outerwear trend, but it also happens that the extra volume the coat provides is just begging to be offset with streamlined skinny jeans. We're keeping a close eye on this buzzy outerwear brand. An outfit idea and a coat. So cozy you won't want to take it off indoors. Combat boots seem to have been made just for skinny jeans. While wearing skinny jeans with other boot styles can quickly result in awkward bunching around the ankles, combat boots with a slightly higher rise offer the ideal tucking ability for the jeans. Oh, and they happen to be a favorite among the fashion crowd right now. What's not to love? Caroline Daur wears her The Row pair on repeat, as seen above. It's official: Everyone and their mother owns this pair (including this editor). These don't just go with skinny jeans. Skirts, dresses, and other pant styles all play well with the boot style. I'm not sure who decided that cardigans were going to be cool again, but I'd like to give them a hug. The traditional sweater never really went away, but suddenly it's become one of the It items of the season. Tuck one into high-waisted skinny jeans or leave the bottom few buttons undone like our editor Nicole did here for a fresh sweater outfit idea. The Instagram-famous top in all its glory. Marc Jacobs just relaunched its grunge collection from 1993, and this cardigan is one of the standout pieces. Skinny jeans and ballet flats… Now that's a combo we've heard before. Unlike how everyone wore the pairing back in the noughties, ballet flat–style pumps are being reinvented for 2019 thanks to the styles from buzzy shoe brands like By Far and Reike Nen. And yes, we highly recommend them for all your skinny-jean needs. By Far's slingback pumps feel classic and new all at the same time. This pair's all in the details. Classic shoes for an accessible price tag. You heard it here first: The next wave of athleisure is all about surf culture. But you don't need to slip into an actual wetsuit to participate in the trend. Thin, quarter-zip tops hit on the sport-tech trend and play quite well with skinny jeans, too, if we do say so ourselves. It's all about the contrasting zipper. Paging all your black skinny jeans. I just picked up this top and have a million styling ideas for it already. Speaking of jeans and trends, see which new denim trends our readers are already wearing on Instagram.